U.S. Surgeon General Promotes Breastfeeding! This week, I spent two days at the Second Annual Summit on Breastfeeding hosted by the Academy of Breastfeeding Medicine and supported by the W.K. Kellogg Foundation. The Summit was here in Washington, DC, and the theme was, First Food: The Essential Role of Breastfeeding. The meeting was packed with information and presentations focusing on a range of topics that included leadership and legislation from federal agencies, breastfeeding community initiatives and community-based approaches, involvement of companies, roles and responsibilities of health professionals, and regulation. I learned a great deal over these last two days on breastfeeding and where we are in this country with initiation, as well as duration rates in the communities we serve. However, what sticks with me the most, are the remarks at yesterday’s luncheon, from the U.S. 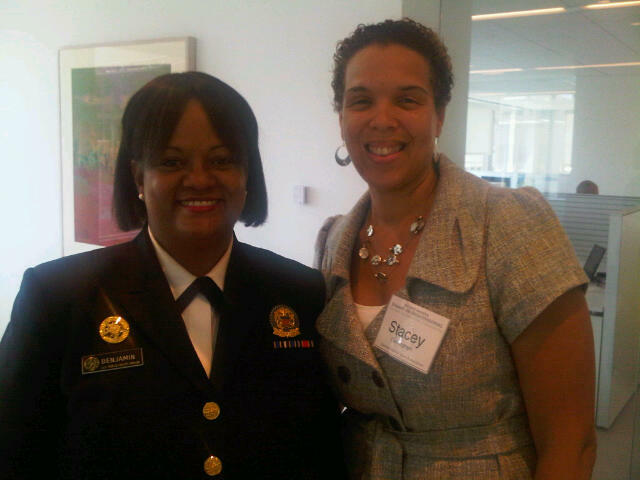 Surgeon General, Dr. Regina Benjamin. I feel compelled to share some of the points that Dr. Benjamin shared with the group, as she talked about the importance of breastfeeding and how we can work together to improve rates in the U.S.
Breastfeeding is a top priority in the Surgeon General’s office and it will continue to be a measure within Healthy People 2020. Despite improvements, socioeconomic, racial and geographic disparities still exist. Women in the southeastern part of the U.S. have breastfeeding numbers that are lower than any other part of the country. This is also the case for the rural communities in the U.S. compared to urban communities. We need to teach moms, grandmoms and dads about breastfeeding to increase the support among women. There needs to be safe and private areas in the workplace for women to breastfeed and/or pump, as well as cooling areas to store the breastmilk. Ongoing research and data — the science — is needed to validate what we are all saying about breastfeeding. These are all things we should keep in mind as we work to improve the health and well being of children. I also had the pleasure of speaking with the Surgeon General about how the NHSA and Healthy Start programs can work with her office to enhance breastfeeding education and increase breastfeeding rates among African-American infants and rural communities. It is our plan to continue this conversation with Dr. Benjamin’s office in the very near future. Happy Friday and continue to give children a healthy start! The U.S. Department of Health and Human Services has released the first of three announcements for the new federal home visitation program. The announcement contains additional details related to the Maternal, Infant and Early Childhood Home Visiting Program that was created by the Affordable Care Act. $90 million will be provided to all states and territories to improve health and development outcomes for at-risk children through evidence-based home visiting programs. The funds are intended to assure effective coordination and delivery of critical health, development, early learning, child abuse and neglect prevention, and family support services to children and families through home visiting programs. The announcement indicates that HHS will soon publish proposed evidence-related criteria for public comment through the Federal Register. Those criteria will be based on an exhaustive study of research evidence related to home visiting programs and will provide a user-friendly source of information for States about different models and the evidence of effectiveness associated with them. Each State must apply for funding by July 9. The State Needs Assessment is due by September 1. The assessment must identify at-risk communities in the state and the quality and capacity of existing home visiting programs.